This year marks 25 years from the fall of communism. It went peacefully, in all but one country: Romania. 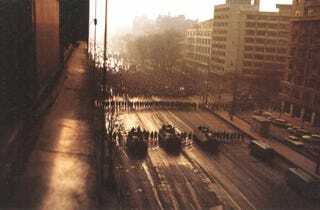 December 21st is the day the Romanian revolution, and as usual, TV stations are showing the harrowing images from those days. People were shot and run over by tanks in Bucharest. It's still not clear who was doing the shooting and who some of the "terrorists" were. Conspiracy theories abound. The mass movement started at a televised communist rally, which means you can watch the exact moment the country's fate was sealed. In truth, the revolution had started several days prior in Timisoara, where people rallied around prominent religious figure Pastor Lazlo Tokes when the secret police tried to arrest him. People died there as well. No one knows exactly how many people died in the Romanian revolution, but the figure is above 1100 people (and thousands more injured). The secret police had forbidden autopsies and ordered the bodies incinerated. No one has so far stood trial for the crimes committed then. So now, 25 years to the day, Romania has today sworn in a new democratically-elected president. President Klaus Iohannis is a former physics teacher of german origin, and former mayor of Sibiu (one of the biggest cities in Romania, and one of the best tourist destinations). His surprising win came after an election fraught with accusations of fraud and discouragement of voters by still current Prime Minister Victor Ponta. Today, he vowed to fight against corruption and urged everyone to remember the fallen heroes of 1989. I hope he keeps them in mind and refuses to sign the new, vague, cybersecurity bill which gives the authorities warrantless access to computers and data on them that the Parliament just voted.